Today, as promised, a post on zombies. 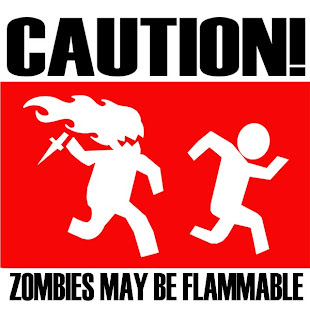 Not just any zombies. Zombie goats. 2. They do not have to die to be infected with the Zombiagulus Virus and indeed are often born with it. 3. They show no preference for brains so donning your protective Zombie Helmet does nothing to keep you safe. 4. They lure their victims with displays of cuteness. 5. They chew anything and everything, often starting with the outer limbs so as to render their victims incapable of flight. 6. They pretend to be foolishly stupid, lulling their victims into complacency before they strike. 7. They infiltrate even the most sacred of human-animal sanctuaries: The Petting Zoo. 1. Wear stripes, solid colors, or nothing at all. Whatever you do, DON'T WEAR PLAID. It aggravates the unnatural horizontal pupil of the Zombie Goat. 2. 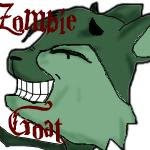 Play anti-Zombie Goat music--Vintage 80's, Classic Rock, and Elvis are sure repellents. Be careful, however. Playing Barry Manilow or Bette Midler has been known to spark county-wide Zombie Goat riots, leaving very few survivors. 3. Avoid the hairstyle-that-wouldn't-die: The Mullet. Zombie Goats recognize those wearing a Mullet as natural prey. Something about Survival of the Fittest and Natural Selection. Don't have one of these? Get one. Fast. Don't wait for tragedy to strike. Act now. Zombie Cats available at local pet shelters in your area. Hmm, I'm not sure whether or not the zombie cat is any better. He looked kind of disturbing. Apparently you should not wear bikinis around zombie cats...kinda ticks them off. Know what else has "unnatural" horizontal pupils? Pretty horses, fluffy little sheep, cutesy moo cows, and octopi. Spread some of that hate around, you animalist. Plus, if zombie goats hate Barry Manilow, how bad could they possibly be? Okay on the Barry Manilow, she does have a point. Kait - Yes, the hatred of Barry Manilow is the Zombie Goats one decent contribution to society. Kerry - *sigh* When's the last time an octopus ate through your handbag in a petting zoo? It's not JUST the pupil. It's the whole thing. Besides, I'm not knocking real, live, kind-of-cute goats. These are ZOMBIE GOATS we're talking about. They are nothing like pretty horses, fluffy little sheep, or cutesy moo cows. Would you except teh goats if they were fluffy-cutesy-moo-octopi goats?! ...I bet you would, hater. 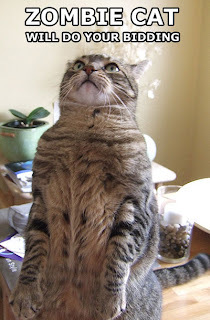 As you entertain me, thou shalt not be shunned. Consider thyself fortunate...HATER. LEAVE GOATS ALONE! SHE'S NOT WELL RIGHT NOW! I'm intrigued by the Zombie Helmet. Do you have pictures? As anyone knows about true zombies, the virus can spread to any and all sentient creatures - of course, this leaves out chihuahuas and other yappy, little dogs, but I digress. This would leave no doubt to the theory that there are zombie goats and/or sheep. Anyone see the movie Black Sheep? Based on a true story according to my information. So, please stop attributing this post to my sister's multiple head traumas - she was always like this, even as a child - which means I believe her. Although, I'm honestly surprised that this tirade contained no mention of the natural ally of zombie goats - zombie moths. Just travel with a can of raid and a cigar torch lighter, you'll be fine. You're not as bad with fire as I am - 3rd degree burns over entire hand, you having to write my homework for me. Yeah, we're probably safer with you handling the pyro stuff.